Last week, my son and I attended the prize giving ceremony of The Fortune Saranghaeyo contest organised by Kenny Rogers ROASTERS (KRR). Three lucky winners won their 4D3N flight tickets respectively to Korea’s Jeju Island, Busan, and Seoul! The winners – Mohd Amin Bin Hadarih, Zahar Bin Amir, and Suzan Binti Vincent were presented with their flight tickets by Andy How, Director of Operations and Restaurant Development and Joyce Kau, Senior Product Market Manager. In celebration of the joyous occasion and the Ramadhan month, the winners were also treated to KRR’s latest Meriah Raya meal, which will run until 31 st July, consisting of Ayam Masak Merah on KRR’s signature rotisserie roasted chicken or OMG Unfried Fried chicken, Kenny’s Nasi Tomato, and the crowd-favourite Riang Ria muffin a creamy pandan muffin with a combination of grated coconut steeped in rich brown sugar. “The Fortune Saranghaeyo meal is our boldest meal promotion to date which became a hit with guests, and this was especially evident when we received an overwhelming response from the contest. This our way to reward guests to keep a healthy lifestyle by eating delicious wholesome meals – which reap fruitful rewards! The key takeaway from this is to advocate that a well-balanced food consumption is truly vital to give one the energy to carry out their day,” said Thila Chandran, Senior Manager of Berjaya Roasters (M) Sdn Bhd. The Fortune Saranghaeyo contest ran from 1 st February to 30 th April 2018 allowed three lucky guests win a pair of 4 days and 3 nights trip to Korea’s Jeju Island, Busan, or Seoul. To participate, guests had to post a picture of them enjoying the Fortune Saranghaeyo meal on their social pages with a creative caption about why they want to travel to Korea with Traveloka. 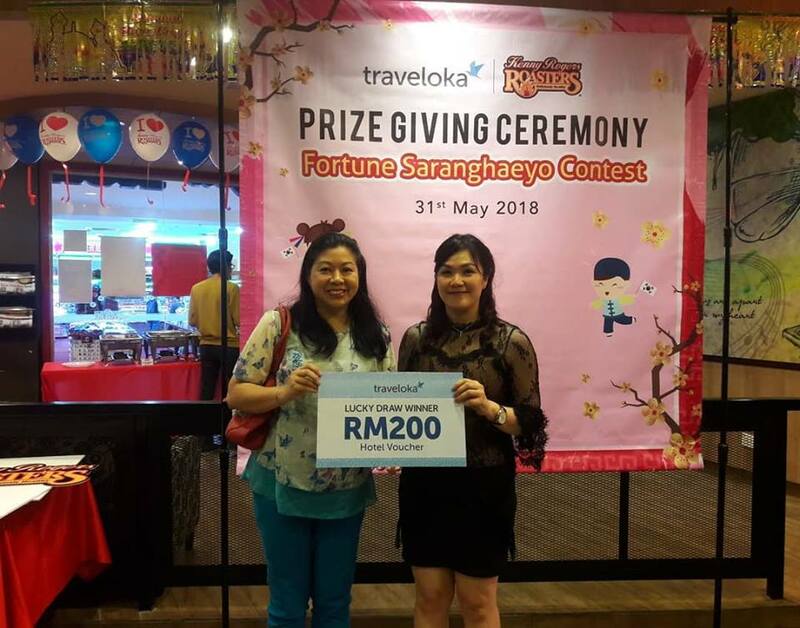 During the prize giving ceremony, lucky draw prizes were also given to bloggers and I was one of the lucky draw winners to win RM 200 Traveloka hotel voucher. Thanks.